In order to do well on Java certifications, you need good books and a reasonable number of practice questions before you go for exams. Practice questions and mock exams will help you to assess your topic-wise preparation level and help you to identify your strong and weak areas. Based upon the result of the mock exams, you can concentrate on areas where you lack expertise e.g. multi-threading is one of the tricky areas. It will also expose you to exam patterns and different types of questions you can expect in examination e.g. multiple choice questions, rearranging code, fill in the blanks etc. Though I highly recommend commercial exam simulators like Whizlabs and Enthuware, I also suggest you take advantage of many mock questions which are freely available. In general, free practice questions are not as good as those from Whizlabs and they lack explanation, but still they provide a chance to identify your weak and strong area. Since Java 8 certification is still quite new and there are not many resources, sample questions, and mock exams are available, I thought to collect and publish some of the free Java 8 mock exams which you can take online. Here are some of the mock exams and Practice questions for both OCAJP8 and OCPJP8 exam. They are useful for preparing exam code 1Z0-808, 1Z0-809, and 1Z0-810. Whizlabs is known for its quality, since I have personally used it when I was preparing for my SCJP exam, I know how useful they are. I strongly suggest you to buy Whizlabs simulator, but if you can’t or you want to assess the quality by yourself, you can take a look at these sample Java 8 certification questions. You can also buy the paid version here. David has also done an excellent job on coming up with Java 8 Web simulator which provides 308 unique questions with explanations for 1Z0-808 exams. In this free test, which is created to demonstrate all the features of their java8 web simulator, You will be able to access 25 full questions and will have 53 minutes to finish the test. Even if you are not buying you can assess the quality of questions and get a feel of what you can expect in the OCAJP8 exam. You can also buy the paid version here. EPractice Labs is another reputed vendor for Java certification mock exams. They have several paid Java SE 8 certification mock exams both for 1Zo-808 (associate exam) and 1Z0-809 (programmer certification). There Free 1Z0-809 Java SE 8 Programmer II Practice Mock Exam is free of cost and contains 29 questions for practice. It’s up-to-date mock exam, which require you to solve those 29 questions on 60 minutes, average exam passing percentage is 65%, which means questions are not trivial. Even if you are not buying their paid mock exam, this free practice question is good enough for a quick check of your skill and preparation. The MyExamCloud OCAJP 8 (exam code 1Z0-808) Practice Mock Exam is an online test which covers real exam topics for Java SE 8 Programmer I exam (1Z0-808), also known as OCAJP 8. It’s the part of MyExamCloud’s OCAJP 8 (1Z0-808) Exam Practice Tests Study Plan, but this particular test is free. All you need to do is create your account on the site, you can even log in using Google, Facebook or LinkedIn account. This practice test was created by Java experts to help Oracle Certified Associate, Java SE 8 Programmer aspirants and it’s one of the better quality mock exam you can get at free of cost. This mock exam contains 30 sample questions for Practice. This is another practice test from EPractize Labs which is designed for 1ZO-810, Java SE 8 Programmer II upgrade certification. This test contains 29 questions and tests your basic skills in each exam objective. The time allowed is 60 minutes and you can take the test at an unlimited time, but I suggest you to use it in the as much real environment as possible. Passing score is 65%. Enthuware is another reputed vendor which you can trust for your Java SE 8 certification preparation. They are on the same league as Whizlabs and because I have personally used their material earlier, I know they are worth of every penny spent. You can download their trial version to try with trial question bank. You also need to install ETS Viewer. The exact number of question may vary, but you won’t find repeated questions. I also suggest you buy the full version of their mock exam, as it contains 600+ Questions with detailed explanations. Here are some basic OCAJP 8 Exam information you must be aware of. I also suggest you to take a look at official Java certification website to learn more about the exam, patterns, and syllabus. Also, there is 20% discount on all Java certifications on account of 20 years of Java, if you happen to schedule your exam before 31st December 2012, don’t forget to avail this discount. That’s all in this list of Java 8 certification practice questions and mock exams. This list is my no means complete and I look forward to you guys to suggest any new resource, mock exams or sample questions you come across. I’ll also keep this list updated so that anyone who is preparing for OCAJP8 and OCPJP8 i.e. 1Z0-808 and 1Z0-810 exam can benefit from these free resources. 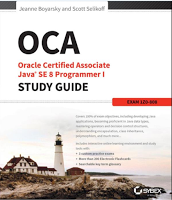 Reference: 5 Free OCAJP8, OCPJP8 Mock Exams and Practice questions – 1Z0-808 809 (Java 8 Certification) from our JCG partner Javin Paul at the Javarevisited blog. Do you mind to update your post? Hi Javin Paul! Thank you for sharing this resources. It would really help me in preparing for the spring certification. I really find it useful especially David Mayer’s Java8CertificationQuestions sample. The questions are cleared and come with an explanation and upon browsing the website I found out a free Web simulator which really improved my way of studying. Thanks a lot, david!